Blow Dryers: Are they emitting harmful radiation? Home » Beauty » Blow Dryers: Are they emitting harmful radiation? Everyone knows that x-ray machines require proper handling due to the radiation they emit. Many believe they should avoid the microwave while it’s on to avoid the radiation it might be emitting. Rumors around what cell phones could be emitting into our brains are growing. But did you ever think your blow dryer could be dangerous to your health? Knowing how blow dryers work is the easiest way to see if they are dangerous. All blow dryers are equipped with at least two switches; an on/off switch and airflow regulations. Many include air temperature regulation as well. 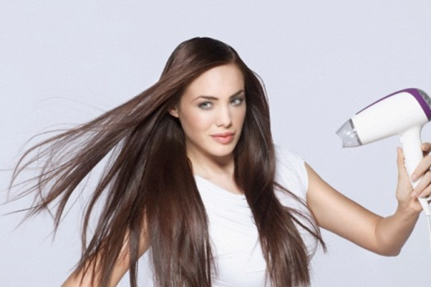 To dry your hair, blow dryers work by speeding up the evaporation occurring the moment you step out of the shower. Hot air is able to contain more moisture than room temperature air, so the heat created by the blow dryer allows for the moisture on your hair to move into the air. In order to generate this heat, blow dryers contain two basic parts: a heating element and a motor-driven fan. Once you turn your blow dryer on, the electric current flows throughout the blow dryer. The heating element is typically the first to respond, and then the electric motor spins, turning on the fan. The airflow from the fan blows through the barrel of the hair dryer where the heating element lies. This forced convection heats the air that you feel coming out of the barrel on to your hair. Do Blow Dryers Emit Radiation? The simple action of electricity to blow a fan and warm a coil may not seem like enough to create radiation. But according to the LA County Department of Public Health, blow dryers, along with televisions, computers, microwaves, and electric blankets emit non-ionizing radiation. This form of radiation is not as detrimental to your health as most forms of radiations that are typically thought of when the word “radiation” is used. Radiation is a part of everyone’s daily life, even when microwaves, blow dryers, and X-Ray machines are avoided. Non-ionizing radiation is known most commonly for causing skin damage. The radiation emitted from your blow dryer is similar to that you experience when you are in direct sunlight without any sun block on. The International Agency for Research on Cancer stated that non-ionizing radiation could cause cancer. Non-ionizing radiation cannot be avoided in its entirety and it is generated by your blow dryer. But before you throw out your blow dryer you should know that there are several blow dryers designed to be safer for daily use. Look for blow dryers that have a ceramic heater rather than a coil. Metal and plastic heating elements tend to overheat hair; essentially boiling the water out of your hair. More heat does not mean a quicker, or a safer dry. Reducing your usage time is another way to be safer. Ionic dryers tend to be quicker at drying hair due to the negatively charged ions it produces. These ions break down water molecules rather than boiling them, and this allows for more moisture to stay in your hair making hair healthier and shinier. A higher wattage is another way to get the best speed. When blow dryers were created in the 19th century they typically could only use 100 watts whereas today they are capable of 2000 watts. The best way to avoid radiation from your blow dryer is to seek out blow dryers that state “low EMFs”. These blow dryers seek to emit less radiation and are eco friendly by using less energy. Low EMF blow dryers are the safest, quickest, and the most eco-friendly of all blow dryers currently available. No one can avoid all the radiation present in our daily lives, but your blow dyer does not need to be thrown out in order to limit your exposure. Knowing more about radiation and about low EMF blow dryers will not only keep you safe, but give you the healthy, beautiful hair you desire. Dana Baker works at Barbar Hair Tools, providing durable and eco-friendly hair products since 2000.